Going into the 2017 season, MSU wanted to reaffirm themselves as one of the top programs in the nation. They needed to after going 3-9 in 2016 — the worst season in head coach Mark Dantonio’s tenure as the Spartan head coach and groundbreaking territory for some players. A year later, after turning 3-9 into 10-3, beating Washington State 45-17 in the Holiday Bowl on Dec. 28 and returning all but three starters — with Scott being the go-to running back — they’ve gone back to the per usual. 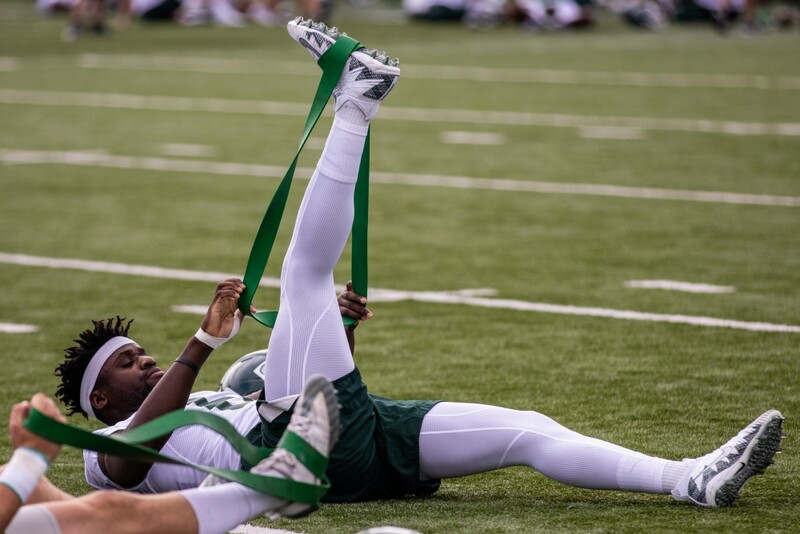 They’ve reaffirmed themselves, Dantonio said during media day Monday. And now they need to build off of that in 2018. “I thought last year we sort of reaffirmed ourselves as a football program and now we need to take another step forward and our players are very excited about that,” he said. Dantonio said the 2017 team brought similarities to the 2013 team, with uncertainty at the quarterback, running back and wide receiver positions when the season started five years ago. Then, as the the season progressed, so did the team, eventually leading up to a potent 2014 team, which Dantonio now sees in this year’s squad. The idea of “Heave” came during a tug-of-war competition during a summer workout. The team which yelled “Heave," according to defensive coordinator and linebackers coach Mike Tressel, wasn’t the team you’d expect to win. But they all pulled at the same time and in the same direction for the win. “It’s basically everybody going in the same direction. Obviously everybody is on one side of the rope, pulling that rope, so we’re all yelling ‘Heave’ going in that same direction,” Scott said. “You know, Coach D is so bright and ties things in with football right then and there. Junior quarterback Brian Lewerke said Dantonio and head strength and conditioning coach Ken Mannie told him this is one of the closest groups they’ve been around. Sophomore wide receiver Cody White said with so many players coming back, and going 10-3 last season, there’s a “different vibe” in fall camp compared to this time last season. “There’s so many guys coming back, we have the chemistry. And everybody can just talk to each other,” he said. White said a key part of that vibe is not being complacent, which has made the Spartans progressively better since their win over Washington State. Especially when the game comes down to inches and decision making, Dantonio said a team needs to be poised enough to win the inches. Which thinks this 2018 team is, while also enjoying each other’s company. And the work, they hope, will turn into something special, like the 2015 team which won a Big Ten Championship against Iowa and made the College Football Playoffs, said Lewerke, who was a freshman that year.